We're big fans of cardboard architecture, but in most cases, the material yields structures that are boxy and rather simplistic. That's why we were blown away when we spotted these incredibly intricate cardboard columns by Michael Hansmeyer, which FastcoDesign actually dubbed as the most complex architecture in the world. 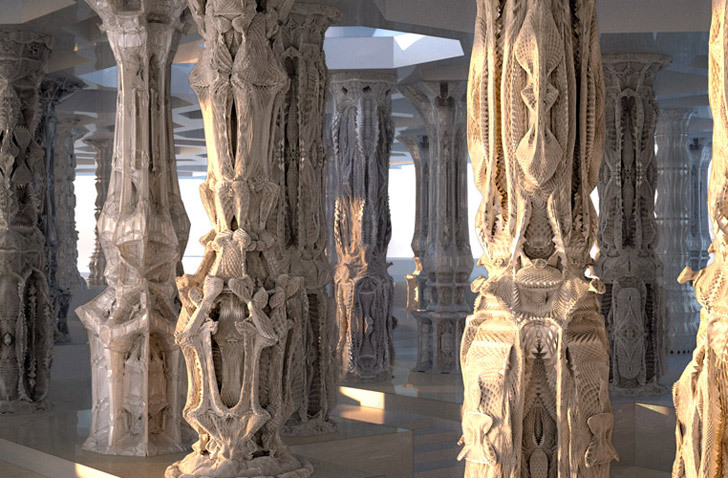 The dizzying Doric column variations are created on Hansmeyer's computer using a subdivision algorithm that allows them to have between 8 and 16 million facets (distinct surfaces). They're so insanely detailed that most people - including us - mistake the actual physical prototypes for computer renderings! So how does one go about fabricating a form with 16 million facets? Well, the first method you might think of is 3D printing, but according to Hansmeyer, his “computational architecture” is actually so complex that most 3D printers would run away with their tails between their legs at seeing it. So Hansmeyer decided to take a different approach – one that might seem elementary, but is actually pretty ingenious when you think about it – slicing his model into thousands of cross sections, laser cutting each one of these out of cardboard and stacking them one on top of the other. While the model as a whole is insanely detailed, each one of the cross sections (see the image above) is actually quite simple, and Hansmeyer realized he could output them on cardboard using laser cutters. Believe it or not, it only took about 15 hours for the machines (three in total working in parallel overnight) to cut out all of the slices. “This would have literally taken months of 3D printing at considerable expense,” Hansmeyer told FastcoDesign. “Our method of fabrication also makes the column very easy to transport: just unstack the slices,” says Hansmeyer. Oh, and did we mention the materials only cost $1500 – imagine how much 3D printing would have run. Looking at the prototype, it’s hard to believe that it’s a real-life physical form. But it is and Hansmeyer even wants to experiment on using his method with more robust materials in order to start building real structures with his “computational architecture.” In terms of eco-friendliness, the cardboard forms would be easy to recycle or be made of recycled materials and according to Hansmeyer, don’t even require glue. “You just slip the slices over the cores and it all holds together,” he says. ah, c'mon man... how stupid does he think the readers of this blog are... the images are rendered 3D objects based on fractals. They are not pictures of the real thing. Slicing it would be possible to some degree, however these examples are not. 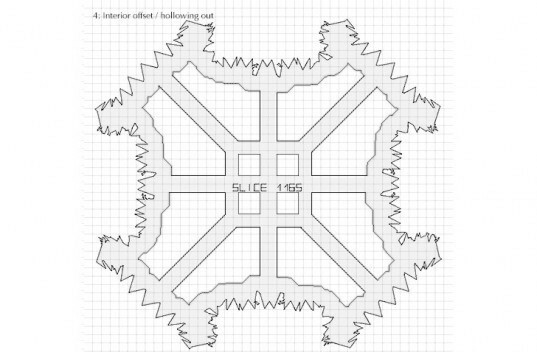 Simply, you cannot slice some of these shapes as many of the overhanging structures would, in a cross-slice scenario, not be connected to the core stem. Simply imagine printing a horizontal cross slice of a human torso with arms dangling straight down. The cross slice would consist of a midsection (the chest) and two non-connected oval shapes (the arms), one to the left and one to the right. Even though your arms are attached to your body, in a horizontal cross slice the regions below your shoulder are not. His shapes feature similar characteristics that in a cross slice are disconnected from the main core stem. The shape is therefore not viable to be printed, unless detached portions are manually alligned and glued in retrospect. 3-D printing would however permit such manufacturing, although the detail would suffer severely. As a mode maker with over 30 years experience. These are not real. They are not stacked layers of laser cut cardboard. They are computer renderings. look at the light and shadows. Truly thinking "out of the box", hehe? The material needn't be confined to cardboard. Think styrofoam, plywood, etc. The laser cutter could be angled for the outside cut to match the profile of the pieces above and below to eliminate the "jaggies", with just a bit more computer time. If the sections are quite thin, say 4-5mm, wouldn't they be self supporting. They would lay down like glulam. I'm sorry, clearly I'm missing something important in understanding the construction of these incredible pieces— if the are an assemblage of very many horizontal slices, where are the horizontal seams? Even when the camera is zoomed in tight in, I see absolutely no horizontal seams(!) Anybody? I dont see the images matching the construction description. They all look like very interesting renderings. Not real constructions! Even if one uses very thin "cardboard", the overhanging areas that extend down or up are going to be separate form the main cut part, so they will need to be attached/glued in order to defy gravity. Even with 3D printing the model is built with "support material" when the model has overhangs. Please explain how these are made. Some real photos would be nice! А вам нравится помочь даже незнакомым людям? Или даже помочь, но при этом не подразумевать того, что вы кому-то помогли? И то, что аренда квартир посуточно сможет мне когда-нибудь помочь совершить такой поступок я никогда бы не мог подумать. Я недавно купил себе новую машину, как говорится сбылась мечта… Отправился я на своей обновке к себе на дачу, ну как всегда посмотреть, проверить - что там и как. Еду. И тут встречаю двух милашек, которые идут рядом с трассой в попутную мне сторону. Я в один момент даю по тормозам и предлагаю им далее ехать со мной. Дважды предлагать им не надо. Дальше мы поехали втроём. Моя дача находится сравнительно близко к городу, поэтому ехать туда около 30-ти минут. Мне показалось, что того времени пока мы будем ехать вполне хватит, чтобы отлично познакомиться и поговорить. А там уже и дача моя будет, и дом двух этажный. Так сладко мне подумалось, что я уже представлял их у себя на даче. Звонит мобильник. Подымаю и слышу моего приятеля. Он мне начинает что-то рассказывать. Из всего произнесённого им я понимаю только то, что он хочет снять квартиру в москве. Я ему предлагаю созвониться малость попозже и уже тогда всё спокойно обговорить. А он мне, нет, говорит, у меня времени вообще нема, я типа уже там, так что давай рассказывай мне про эту аренду недвижимости. Эх, что же, надо выручать человека. Говорю ему, что идеальнее всего тогда, когда ты осуществляешь аренду квартир без посредников, москва к тому же легко позволяет это сделать, так как выбор там очень большой и т.д. и т.п. В результате, рассказал ему про аренду квартир без посредников всё, что знал сам. Он поначалу мало чего соображал, но через несколько минут начал въезжать. ”Любая недвижимость, аренда квартир и прочее с этим связанное может осуществляться прямо с собственником этой квартиры, либо через посредника, который будет требовать оплату за свои услуги - продолжаю я ему рассказывать. Если не хочешь тратить лишнего и хочешь больше гарантий - ищи аренду у собственника. Моя дача - самый яркий пример. Припоминаешь, я её в аренду сдавал когда на отдых ездил?” Девчонки рассмеялись. Мой телефонный собеседник услышал как они смеются. Ты чё там не один? С девчонкой? Улыбаюясь, я отвечаю, что да, и даже сразу с двумя. Он - ооооо, понятненько, сори братишка. Кладёт трубку. Стараюсь выяснить причину женского смеха. Одна говорит, что типа я щас такую классную лекцию прочитал про сдачу квартир, а они как раз планировали дачу снять в этом районе. Так нет ничего проще - отвечаю я им. В конечном счёте, случайные попутчицы остановились у меня на даче на месяц. The only problem would be trying to keep the dust off and out of these 16 million+ crannies. But how were the original models (the ones sliced and scanned) made in the first place? The column DESIGN is the eye-catching part, not the construction. Am I missing something? @Candy I'm pretty sure that if you sprayed them with concrete, they'd lose all their detail. Perhaps it's possible to create moulds from them and fill the moulds with plaster or something?! I would love to spray with concrete and use for building, they are fantastic. Wow! When they become available to consumers, I would like to be your first customer. Stunning. Hope it doesn't get wet. Truly incredible! The fact that it was done so fast ans cheap makes this type of architecture affordable for regular folks like me. I'm going to follow this guy for sure. Now I want to know If I can do this with weatherproof materials for landscape retaining walls! Bravo! Would these be structurally secure? Looks like they're hollowed out in the center for re-bar or concrete. So how does one go about fabricating a form with 16 million facets? Well, the first method you might think of is 3D printing, but according to Hansmeyer, his "computational architecture" is actually so complex that most 3D printers would run away with their tails between their legs at seeing it. So Hansmeyer decided to take a different approach - one that might seem elementary, but is actually pretty ingenious when you think about it. First, he sliced his model into thousands of cross sections using a computer program. One of the cross sections. While the model as a whole is insanely detailed, each one of the cross sections is actually quite simple, and Hansmeyer realized he could output them on cardboard using laser cutters. Believe it or not, it only took about 15 hours for the machines (three in total working in parallel overnight) to cut out all of the slices. "This would have literally taken months of 3D printing at considerable expense," Hansmeyer told FastcoDesign. "Our method of fabrication also makes the column very easy to transport: just unstack the slices," says Hansmeyer. Oh, and did we mention the materials only cost $1500 - imagine how much 3D printing would have run. Looking at the prototype, it's hard to believe that it's a real-life physical form. But it is and Hansmeyer even wants to experiment on using his method with more robust materials in order to start building real structures with his "computational architecture." In terms of eco-friendliness, the cardboard forms would be easy to recycle or be made of recycled materials and according to Hansmeyer, don't even require glue. "You just slip the slices over the cores and it all holds together," he says.